Merry Christmas, Happy Holidays and Happy New Year! I present my 2013 Christmas Card. I did a bit of everything on this one, die cutting, distressing, stamping, stitching, string, etc. 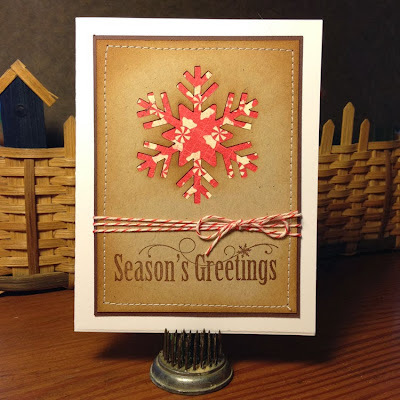 My inserts cut on my Sizzix Eclips and ready for edging with Ranger Distress Ink. 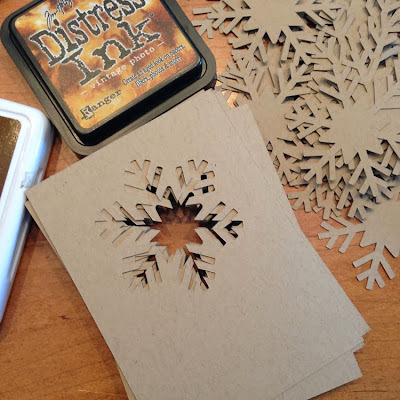 I have lots of cutout snowflakes to use on some future project (like I need more stuff to add to my stash for future projects!). 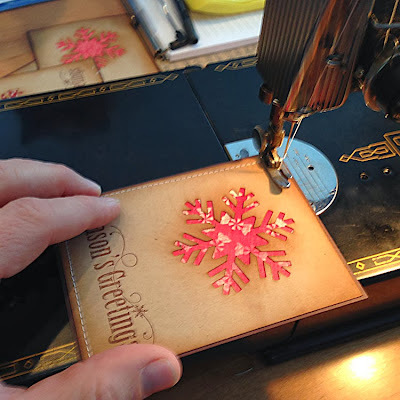 I have always like the look of cards stitched on a sewing machine, but had yet to try it. I am not a taylor by any means, so some are not exactly stitched evenly around the edge, but I just tell myself that makes them look more homemade... Actually it wasn't nearly as bad as I thought and I actually learned a bit about using this vintage Singer featherweight that my Dad found for me years ago. I even learned how to wind the bobbin and re-thread it quickly, as Grayson kitty liked to play with the string and would manage to have the thread completely loose every time I would sit back down to stitch some more. I hope everyone wasn't as last minute as I was this year. I do think everyone should receive their card before Christmas. I still seem to send out about twice as many cards as I receive, but so many of my friends say they keep my cards and have even hang them on their tree that I can't not continue to send them one. So, if you do get a card from me, know that you are pretty special to me as I have whittled down my list from about 100 to a little over 50. But, if you aren't on my list, please accept this digital card as my wish to you to have a very merry Christmas, happy holiday and hears to a fantastic 2014!